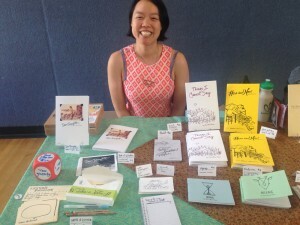 In this workshop led by local zine-maker Christina Tran, we will dive into the radical history of zines and the power of self-publishing within a community. By exploring selections from the facilitator’s personal zine library, we will learn different forms of bookbinding and try our hand at making mini-zines. Additionally, we will collaboratively create a zine on the theme of Corvallis. Each person will walk away with a mini-zine they create on the topic of their choice, a copy of the Corvallis Anthology we make together, and many more templates and ideas for future zines! About Christina: Christina Tran makes tender, autobiographical comics and essays that imagine and call us toward a more compassionate world. She has been making webcomics since 2014 and self-publishing zines since 2015. Her artmaking is influenced by her background in design, teaching, and community work. Christina is a caretaker at the renegade community art space in Corvallis called Mt. Caz. Find more of her work online at sodelightful.com.